The first prototype of the Hurkus C attack aircraft was unveiled in February 2017. Image courtesy of Turkish Armed Forces Foundation. The Hurkus C armed variant is equipped with seven hardpoints. Image courtesy of Turkish Armed Forces Foundation. Hurkus basic and primary trainer aircraft served as the basis for Hurkus C armed variant. Image courtesy of TAI - Turkish Aerospace Industries Inc. The attack version is intended to support different operational requirements of the armed forces and can be deployed in missions such as close air support (CAS), light attack, intelligence, surveillance, armed reconnaissance, and basic and primary pilot training. The Hurkus-C light attack / reconnaissance aircraft features fixed-wing design with armour reinforced airframe. The aircraft has an overall length of 11.17m and a height of 3.7m. The main wings are mounted near the bottom of the fuselage. Winglets are fitted on the upper surface of each wing to generate additional lift and greater aerodynamic efficiency. The conventional tail section comprises two low-mounted horizontal planes with a single vertical stabiliser. The aircraft’s take-off and landing operations are assisted by a retractable tri-cycle landing gear consisting of two main gears and a steered nose gear. The landing gear also allows the aircraft to operate on unprepared runways. The Hurkus-C attack variant is equipped with a total of seven hardpoints, three under each wing and one on the fuselage, to carry external loads weighing up to 1,500kg. It can carry a fuel tank with a capacity of 70 gallons on external mounts. The aircraft is also installed with self-protection systems. The Hurkus-C variant features next-generation digital cockpit, which accommodates up to two crew members in tandem configuration. Compatible with night-vision goggles, the cockpit incorporates advanced avionics systems to deliver enhanced situational awareness and mission planning by reducing the pilot workload. The cockpit’s ergonomic design creates comfortable working conditions for the operators. Avionics aboard the aircraft include digital flight instrument displays, multi-functional displays (MFDs), head-up displays (HUDs), LCD screens, and navigation systems. 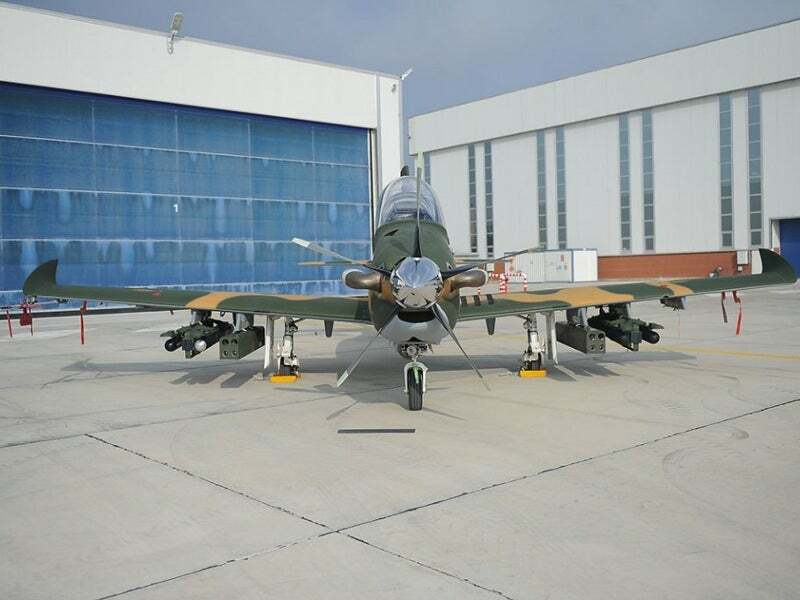 The Hurkus-C light attack / reconnaissance aircraft is designed to integrate a range of bombs and rockets on the external stores to engage ground-based stationary and moving targets. The armament options include UMTAS / LUMTAS anti-tank missile system, Roketsan Cirit 2.75in laser-guided air-to-surface rocket system, GBU-12 laser-guided bombs, MK 81 and MK 82 unguided general purpose bombs, BDU-33 and MK-106 practice bombs, and HGK-3 INS / GPS and KGK-82 wing-assisted guidance kits for general purpose bombs. The aircraft can also be armed with a 12.7mm machine gun and a 20mm machine gun pod. An electro-optical / infrared (EO / IR) imaging system is carried under the fuselage to capture real-time imagery / video for intelligence, surveillance, reconnaissance and situational awareness operations. Consisting of optical and thermal imaging cameras, the EO / IR turret provides crew with the ability to identify, track and engage targets during both during day and at night. The aircraft uses a video / data link to transmit imagery and telemetry data captured by the onboard sensors to the ground station. The Hurkus-C armed version can be powered by either a single 1,600hp Pratt and Witney Canada PT6A-68T turboprop engine or a 1,400hp TUSAŞ Engine Industries turboshaft engine. "The attack version is intended to support different operational requirements of the armed forces and can be deployed in missions such as close air support (CAS), light attack, intelligence, surveillance, armed reconnaissance, and basic and primary pilot training." Mounted in the forward portion of the aircraft, the engine drives a five-bladed Hartzell HC-B5MA-3 aluminium propeller, which provides increased manoeuvrability in forward flight. The maximum cruise and stall speeds of the basic variant are 574km/h and 143km/h respectively. The aircraft has g limits of +7 / -3.5g and maximum service ceiling of 35,000ft. It is capable of flying over a distance of 1,478km. The Hurkus variants include Hurkus-A basic and primary trainer aircraft and Hurkus-B new-generation basic trainer aircraft. A prototype of the Hurkus-A trainer performed its maiden flight in August 2013. The aircraft is certified by the Turkish Directorate General of Civil Aviation (DGCA), as well as by the European Aviation Safety Agency (EASA).